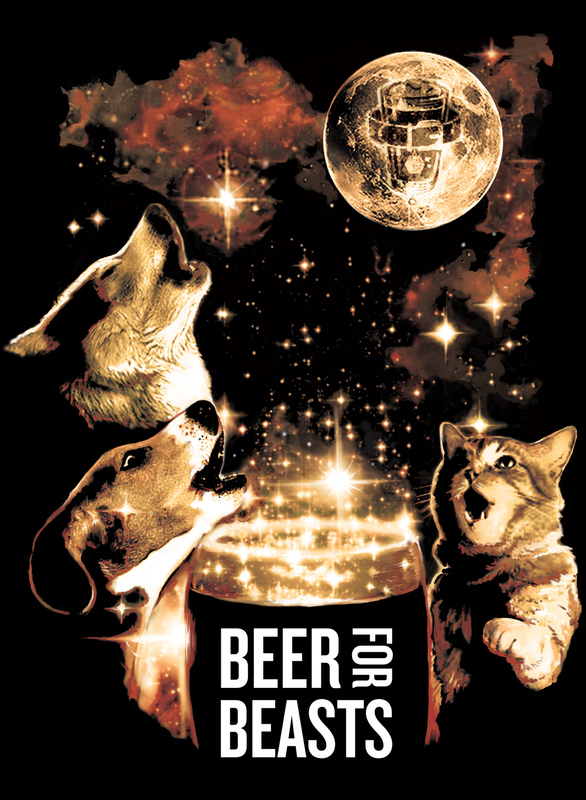 Let’s have a howl for designer Matthew Furber, for helping create this sick t-shirt that will be available at this year’s Beer For Beasts. Every cent of proceeds from this shirt will also be donated to the Humane Society of New York. Like many of the beer and food offerings at Beer For Beasts, this one-of-a-kind shirt was forged with the help of the community. And since only a limited number of shirts are being made, those who’ve already supported the charity by purchasing a ticket will get to snag one at the festival on March 31st. In the same way the logo for Beer For Beasts and the individual Sixpoint can designs are rich with symbolism and iconography, the t-shirt design has more than meets the eye. First of all, the Sixpoint staff has a penchant for sci-fi and vintage screen-printed t-shirts. 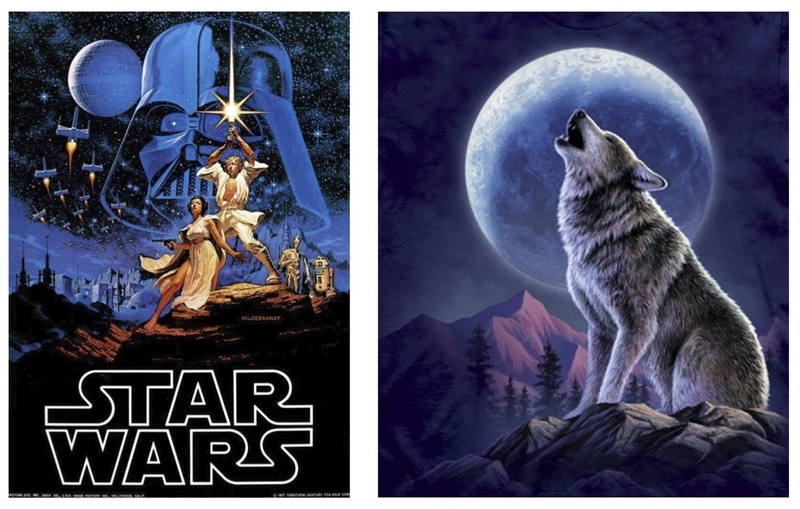 The design concept was influenced by two inspirations: this circa-70’s poster for Star Wars and the wolf shirt featured below. Matthew, an illustrator who creates fantastic sci-fi comics, drew from his penchant for colors and particle effects to create a design that’s intricate, ethereal, and just lovable. In addition, the live entertainment and soundtrack for Beer For Beasts is provided by B4B resident DJs Chances with Wolves. Their live sets are punctuated by eerie wolf howls as a signature flair. The animals on the t-shirt are not only alluding to the rescued beasts at the Humane Society; they’re also referencing the howls from the live music at the event, and the folks howling in Brooklyn, getting down at the Bell House! But we didn’t have to travel to another galaxy to get the shirts made. Right down the street from Sixpoint on the waterfront is a screen printing and embroidery services shop, Quist. Quist helped turn the multi-layered illustration into a screen print for the shirt, which will be solid black. The screen printing for this shirt is a more complex and layered one, requiring six different types of ink. Having never done t-shirts before, we believe Matthew seamlessly integrated his artwork into this medium with spectacular results. The design took more than a month in the making, but we’re psyched about the results. Plus, the furry trio of beasts on these shirts looks like the perfect image of teamwork if we ever saw one — each beast howling in harmony. There will only be 120 of these available, for a $25 donation to the Humane Society of New York. So don’t go to the dark side, grab one at the Humane Society’s table at Beer For Beasts (and please limit one per customer).